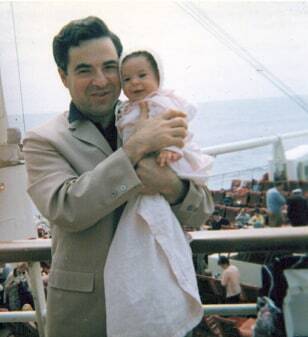 Arthur Frommer holds his daughter Pauline on a trans-Atlantic crossing from New York to France in 1965 aboard the S.S. France. Frommer is credited with helping to change leisure travel by showing average Americans that they could afford a trip to Europe. Arthur’s daughter Pauline carries on the tradition with her series of guidebooks.